We commemorate rather than celebrate May Day with the first of three photos documenting the aftermath of the devastating magnitude 7.8 earthquake that struck Nepal on April 25, 2015. 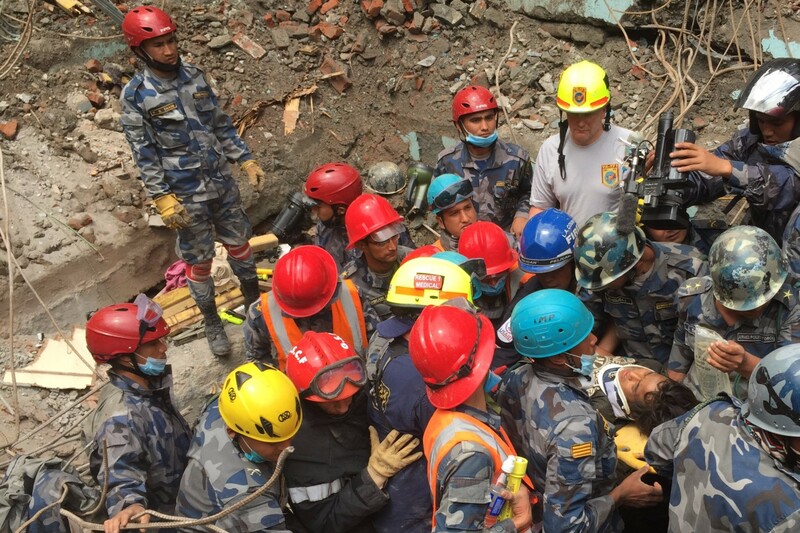 Yesterday, rescuers pulled 15 year-old Pemba Tamang from rubble that fell nearly a week earlier. One of the relief workers shot this dramatic image using iPhone 6. Another, which I prefer but discarded because the teen isn’t visible, was taken with a Samsung Galaxy Note 10.1 tablet! I cropped the pic to remove a hand and mobile that photo-bomb the moment. My composition puts the boy’s head, visible from the stretcher, in the lower-right corner and in the direction he is being carried. Amazingly, reports from Kathmandu indicate that Pamba suffers no dramatic injuries. Photo vitals: f/2.2, ISO 32, 1/648 sec, 4.2mm.